This weekend, Friday and Saturday, I’ll be attending is the 7th annual Northern Voice, a personal blogging and social media conference held every year here in Vancouver. Last year was my first time. I got asked by Darren Barefoot to be on a panel about social media and the arts, and I wrote a post about it afterward called Building a Mystery. For me, conferences like these are very powerful. Not only do they make my brain ping off in all directions and provide me with knowledge and inspiration, but there is something so wonderful about the sense of belonging there. It’s a place where I bump into old friends, and get to have real-life interactions with people that I primarily see online. It’s a place for meeting new folks and connecting. It’s a place where you don’t get funny looks for tapping on your keyboard while someone’s talking, or tweeting during a presentation. It’s a place where technical questions get answered, and we speak a common language. If you are going to be at Northern Voice, I’ll be on a panel with Kazia Mullin and Lorraine Murphy on Friday morning from 11 to 11:45 am called Courting Controversy: Dancing With the Devil. I look forward to connecting in real life. 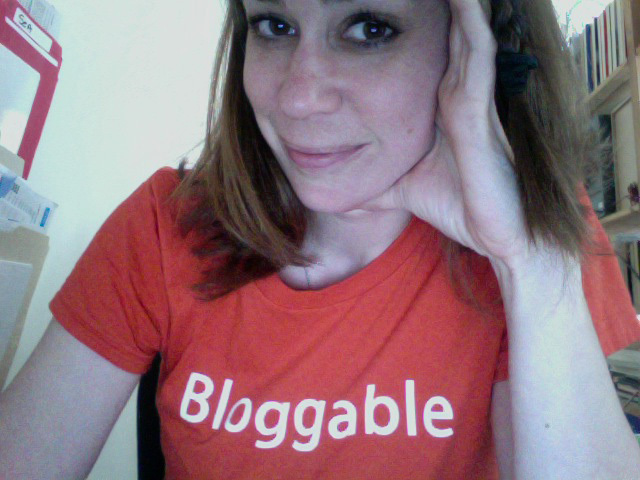 And to my new Bloggable t-shirt!